Things are a little strange in Digital Land right now. There seems to be much uncertainty when it comes to what format will prevail, if any, over the trusty "old" compact disc. Would I buy a SACD or DVD Audio player right now? Not on your life. They might go the way of the Digital Compact Cassette. By the same token, nor would I drop big bucks on a "regular" CD player. They too, might become extinct. Not that I think it will happen, but I would rather be safe than sorry. In any case, I think that the powers that be aren't rolling out new formats to do a favor for the music lover or audiophile. In my opinion, it's just a case of greed: patents on the CD have expired or are currently expiring. Every time a CD player or CD are sold, Sony and Philips get a piece of the pie, with the patent protection expired, they get nothing. Now, a new "cash cow" is needed. Count me out. It would have to be one hell of a dynamite format to make me change now. For the time being, I've bought my last copy of the "White Album". What I do think is prudent at the present time is a reasonably priced, high quality CD player, which leads us to the Cambridge Audio D-500SE. Cambridge Audio, based in London, works in concert with other companies to design an alternative to mass-market audio gear. The D-500SE was designed with Sony, and manufactured in the Far East (China) to keep costs down. Cosmetically, the D-500SE sports a very clean, if understated, appearance. All of the controls are intuitive in use, including the "jog shuttle" dial on the far right of the front panel. The jog shuttle dial; offers control of all disc track and seek functions. The review sample was provided in an attractive matte silver-gray finish; matte black is also available. The front panel is manufactured of metal, no plastic here. That's a very nice surprise, considering the price. The D-500SE definitely exudes an air of quality. It is covered by a 2-year manufacturer's warranty. Additionally, you may be aware that Lucio wrote a review on the predecessor to the D-500SE, called the D-500. The distributor has advised me that the D-500 was discontinued some eight months ago. The models are quite different. First, the DAC boards in the D-500SE are completely different from its predecessor, the new model featuring plug in boards that be easily upgraded as technology changes. The DAC also up samples at 24bits/192kHz, stunning considering the price. Additionally, the new unit has a more robust power supply. The D-500SE does have the same "fake toroid" transformer that Lucio discovered in his review of the D-500. While Lucio's idea is that it makes the unit look more "high end" (my quotes, not his), it is possible that the cover is not there just to beautify the interior of the unit: the cover may also act to shield the rest of the unit from stray magnetic fields originating at the transformer. This is purely conjecture on my part. Lucio made the same hypothesis. If Cambridge Audio had anything to "hide", it would be the fact that the unit is manufactured in China, but that's clear as daylight by the sticker affixed to the back panel. The D-500SE was broken in over a 4-day period, 24 hours a day. To make sure that the break in period wasn't just a case of my "getting accustomed" to the sound, I listened to the unit for a period of no longer than 30 minutes per day over this time. On the fourth day, the soundstage really opened up. There is no doubt when this unit is ready for serious listening. While the D-500SE is fitted on the usual plastic feet, with rubberized inserts, I auditioned it atop 3 "Tip Toe" like supports, for better isolation. The unit is provided with a removable IEC power cord, I tried it, but settled on the Sonic Horizon Daybreak power cord that had been previously connected to my Jolida JD-603 CD player. Interconnects were by Monster cable (I've had them for years, sorry I can't remember the model.) The closest in their current line would probably be the M-550. The most striking quality of the D-500SE was its openness. There are many recordings that had more "air" around the instruments, from The Grateful Dead's "Workingman's Dead" to the Beatles "White Album". I have heard components that reduced air around instruments, that removed the "venue" from the recording, but I have never heard (or heard of) one that added it, so I have to believe that this is the player's strong suit. That is to say, I don't believe that the D-500SE is adding anything to the signal. I believe it is letting everything through. The bass response was taut, deep, and sufficient in amplitude. I certainly have no complaints in this department. The upper frequencies are smooth and detailed, which is usually not the case in a budget digital component. The midrange was a bit different to which I have grown accustomed. The "warmth" of tubes is gone (obviously) with the D-500SE in place of the Jolida. A shame really, but there are those who feel that "glass bottles" are unnatural, and add their own sonic signature to the music. This may or may not be true, but a bit more warmth in the midrange would be a plus in my opinion. I like a "liquid" midrange, lush, romantic, and probably colored, but I like it. The D-500SE is cleaner, and a bit more forward than the Jolida. Keep in mind, there is no such thing as a "perfect" CD player, if there was such a beast, we would all own the same one, the only one manufactured. What I am talking about here is a matter of taste. While we may both like a fine steak, I may like mine medium rare, and you may like yours medium, the fact remains that either way, it's still a fine cut of steak, prepared differently. Neither one of us are necessarily "right" or "wrong". Pace and timing seem normal. This was Lucio's big complaint in his review of the D-500. He said that unit was very slow. Not the case here. It is definitely not slow here, nor is it fast. It seemed to have no problem "locking" onto the music and was able to convey even the most complex musical passages without breaking a sweat. Listening to the D-500SE, these terms really became a non-issue. It just played music. I had no problems whatsoever with tracking ability. It tracked better than my Jolida JD-603, and initialized discs quicker as well. The unit was totally reliable for the 2-month period it resided in my system. Regarding sound quality, I have really had to dig deep to find dislikes with this unit. It would be easy to spend more and do worse than the D-500SE. This is an excellent player. First, I wish the top chassis were a bit thicker, or short of that, had been affixed with a bit of damping material on the underside. This is easily remedied at home with a bit of Dynamat or rope caulk. Additionally, while the BNC connector (for use connecting an outboard D/A converter) is technically the best type of connection available, I think it is overkill on this piece of gear. There are several advantages of a BNC connector over other types: better shielding, true 75-ohm impedance, and the most secure connection scheme. However, it is my belief that a user that owns a D/A converter that has a BNC input will ultimately use a far pricier unit than the D-500SE as a transport. Granted, the D-500SE also has a Toslink output, but I feel these to be inferior to either a BNC type or RCA type connection. Because my D/A converter does not have a BNC input, and the digital RCA output on the D-500SE has been unfortunately omitted, I did no tests on the D-500SE as a transport. At the price, I believe the D-500SE may not be taken seriously. That would be a mistake. 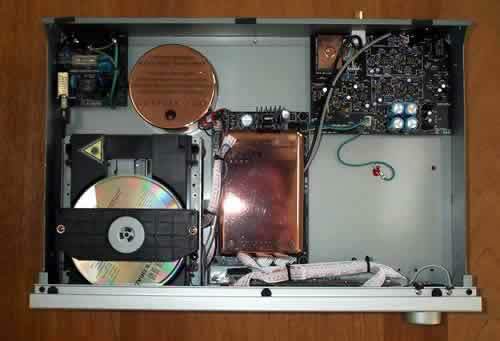 This CD player deserves to be mated to higher quality electronics than its modest price would suggest. Additionally, I believe a home audition is mandatory for those interested in making a purchase. Due to the fact that I was formerly employed on the retail end of the audio industry, I am all too aware of the setup procedures of most audio stores: remove it from the box, slap it on the shelf, hook it up, and sell, sell, sell. No break in, usually no concern for power cords or interconnects, and very little, if any concern given to isolation from vibration. I believe this will be the rule, rather than the exception for the D-500SE, given its low price. Attention to these details will affect the level of performance attained with this unit. Also, those interested may find that the salesperson may attempt to discourage a purchase in favor of another, more expensive, model. Keep in mind, most salespeople make commissions on their sales, and usually, more expensive sales result in bigger commission checks. While I was on the sales floor and later a store manager, it was well known that a customer who came in for a piece of gear could usually, without much resistance, be shifted or "bumped" to another piece of gear up to twice the price. While it would be easy to spend more on a CD player, I believe one would have to spend much more on a CD player to achieve an appreciable improvement over the D-500SE. For those interested in the D-500SE, I would recommend use high quality power cord and interconnect cables, and do not rush the break in period. The D-500SE needs 3-4 full 24-hour days to show its true mettle before making any final opinion as to its qualities. Just leave it on repeat, and go about your business. With a bit of patience, you will be rewarded. For those with some DIY skills, I would suggest trying the D-500SE with the TNT Twisted Snake Power Cord and the X Cables Interconnect. With these components, it wouldnÕt cost much at all to wring more performance from the D-500SE. I believe Lucio's review of the D-500 to be totally accurate, but the Special Edition is completely different animal, and in my opinion deserves its "Special Edition" badge. I would like to thank John Bevier of Audio Plus Services, Cambridge Audio's North American importer, for providing the review sample. Nice job! We appreciate the time and interest you have given our Cambridge Audio D500SE CD player. Your factual representation of the D500SE is spot on, and we agree with most all of your conclusions. As you commented, it's true we're in the middle of a transition between initial digital recording and playback systems, and newer higher sampling density formats and machines. As an industry and as audiophiles we all have an interest in and responsibility to keep pushing for the most realistic musical recreation possible in our homes - these new formats hold the opportunity for greatly enhanced realism and emotional communication via the musician's artistic expression. The problem is, as you wrote, we've not established a final format solution, and our library of available music is tiny. But, it's an exciting time to be an audiophile and watch these developments! Cambridge Audio has always tried to create products that offer 95% of what's theoretically possible, for a fraction of the price. I think the D500 SE is Cambridge's most successful product to date in expressing that commitment to build extremely high value, high performance devices. Ideally, our products should never draw attention to themselves; should neither add, nor subtract anything from the original recording. Given unlimited money and enough time, talented engineers can come pretty close to this ideal. The REAL trick is to make necessary trade-off's to keep cost down (like top-case thickness and plastic support feet) while retaining the capacity to breathe life into our musical recordings. Cambridge Audio takes pride in offering this kind of musical and monetary performance at a price point millions of music lovers can easily afford. One clarification - you noted the transformer possibly being "Hidden" to perhaps offer a nicer face to gaze at under the hood. We secure a magnetic "Can" shield over the top of the transformer to reduce the tendency every transformer has to spray stray magnetic field around the surrounding circuit board region. Low-level signals are easily and negatively affected by these unwanted magnetic influences - something we knew we needed to minimize -hence the covering hood approach. Simple, effective, and cost reducing - as well as a solid example of our engineering teams ability to be creative and not lose sight of our "Sound First" design approach. Your concern about the average customer not hearing all the performance this CD Player has to offer is valid. We have faith in our retailer's ability to do a proper demonstration; but it is a little counter intuitive to think about spending more money on interconnects, AC cables, and vibration reduction treatments than the cost of the player itself! If you really set this CD Player up to maximize it's engineering potential you will have a device that's able to match, and in some cases, exceed, some very very expensive big name machines. Too cheap - maybe. Extreme value - no question. The Cambridge Audio D500SE CD Player is a great place to sit while our industry tries to settle on along term high-bit digital recording/playback solution. In the meantime you can lean back, chuckle and enjoy your music. The music is, after all is said and done, the reason we pursue this hobby with as much energy as we all do! Thank you again for taking the time and interest in our products - we appreciate your efforts and commitment to our industry and our passion.